Sometimes, it’s fun when things bounce. Other times, not so much. Bouncing on a trampoline as a kid? Fun. Having your email newsletter or marketing blast bounce? Uh, that’s considerably less fun. In fact, it’s not fun at all. Unfortunately, that latter situation has happened to everyone at least a few times in their careers. Hopefully you don’t find it happening to you too frequently. If you do, though, you probably want to know why it’s happening and what you can do to cut down on that frequency. Good thinking on your part. We’ll get to all of that momentarily and help you out with your bounce issues. But first, let’s take a look at what email bounces are. If you already feel as though you completely understand the concept, then by all means skip ahead a few paragraphs to the solution part of this post. But if you’re not an email bounce expert, then we recommend you take a few minutes to read this entire post so that you can better understand bounces, which will in turn inform your understanding of how to decrease your email bounce problems. 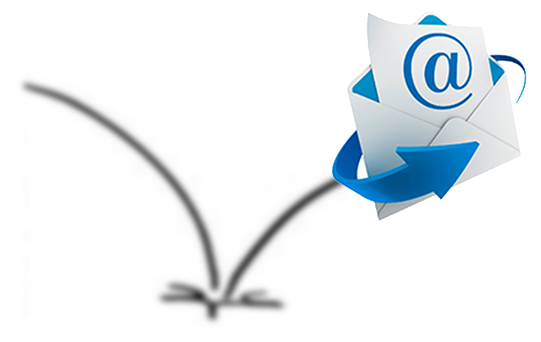 What Is an Email Bounce and Why Does It Occur? Email bounces are forms of autoresponders. When an email bounces, you receive an automatic response from a program in reply to the email you sent to the address that is causing the bounce to occur. The majority of email bounces happen because there is either a temporary or permanent problem with the address that is on the receiving end of your sent mail or because the receiving server is blocking your email. Either way, they’re a pain. As mentioned, when a bounce takes place, the intended recipient’s email server shoots you an automatic response. Contained in this response should be a description of the reason for the unfortunate occurrence. Many email account providers and marketing email programs provide their users with tools that cause automatic actions to take place for different types of bounces. So that’s a lot of auto stuff. In fact, if there was any more “auto” stuffed in there, we’re pretty sure Michael Bay would be filming it, but we digress. In any case, your automatic action options usually include the ability to filter out addresses based upon bounce issues associated with them and/or send a followup requesting updated contact information or prompt them to correct problems that may be causing unwanted bounces. Which actions are taken depend on your personal settings and what type of bounce has occurred. There are several different bounce types, so let’s take a quick look at each of them. Your email wasn’t delivered. Unfortunately for curious minds such as yours, the recipient’s email server has literally no idea what the specific reason for it is. This is called a general bounce. More often than not, these cases are related to our next bounce variety. • Broad (general) issues that cannot be narrowed down to a specific problem. • The email contents and/or attachments are excessively large and surpass the recipient email server’s size limits. • Your message went through, but the recipient had his/her auto-reply turned on. The email’s bounce status will be eliminated when the person on the receiving end opens the message you sent. • An automatic response is set, but not because the person is unavailable to respond, but because they are asking to be added to your distribution list. • The recipient’s inbox is stuffed to the max, so there isn’t any room left on its server for your email to live on. • Finally, there are DNS failures. When these happen there is probably a nameserver setting problem for your domain. Get in touch with your domain administrator for help resolving things. If you read the description of soft bounces, you’ve probably already guessed what hard ones are: permanent. They usually take place when the email address you sent a message to no longer exists or never existed in the first place. Maybe the recipient changed his or her address, maybe they – or someone else – gave you the wrong address or maybe you transcribed it incorrectly. Most marketing email programs automatically remove hard bounce addresses from your subscriber list. If you wrote and/or authorized your email, then you probably think it’s just terrific and relevant to everyone you’re deploying it to. Unfortunately for you, that’s probably not the case. And thanks to the CAN-SPAM act, your emails have to contain a way out for those who don’t want to receive them any longer. So when somebody wants out, they click the unsubscribe link in your email, and you have to remove them from the distribution list. Now that you know what email bounces are, what the different types are and why they occur, it’s time to dig into the question you came here for. Bounces are bad because they have undesirable effects on deliverability and your campaign’s success. It’s expensive and time-consuming to build a distribution list, so you want yours to be a strong one. That’s why it’s so important that you constantly keep a close eye on your bounces. The reaction you want to make to any given bounce will depend on the type (see, this is why we had you read about bounce types earlier). If mail is undeliverable, it’s entirely possible that the server is down for maintenance or has crashed. Your first move should be to wait a bit and then resend. If the issue persists, then it may mean that the address or server may be gone for good, meaning the smart bet is to just remove it from your list. When you get a vacation or other temporary auto reply, your email was successfully deployed; it just wasn’t received. Hold out a bit and try, try again. Keep an eye on addresses that repeatedly have this issue, though. If months have passed by and you’re still getting the auto reply, then it may be time to nix the address. Is the recipients’ mailbox full? Do you have other contact information for him/her besides an email address? Then take advantage of that resource. Pick up the phone and give them a call, send them a physical letter or try an alternate email address notifying them of the issue. Keep in mind that the email address may no longer be in use, so if nothing is eliciting a response then it’s time to cut this target from your list of subscribers. Does the email address you attempted not exist? Maybe you got a fake email address from someone who didn’t want to give out their real address but wanted whatever you were promising in return for an address submission. It’s also possible that there is just a typo in the address. Double check to make sure you got the address right. Try contacting the person through other means if the address is as provided and it still isn’t working. If that gets you nowhere fast then it’s time to – you guessed it – remove this address. If your email is being blocked by the recipient server’s strong security or anti-spam measures, then you’ll need to reach out to them and ask them to make an exception for your deployment address. It’s possible that they’ll even have to contact their system administrators to request an exception be made for you. That’s pretty much all there is to it. Not so tough, right? Keep a close eye on all bounced emails and do what you can to get them delivered the next time around. But keep in mind that that may not be possible and be prepared to dump addresses that are bouncing over and over again with no solution in sight. Keep your list strong! backlinks. You need more authority links in order to rank. I’m curious to find out what blog system you’re utilizing? I’m having some minor security issues with my latest site and I’d like to find something more safeguarded. Do you have any recommendations? I create a leave a response when I especially enjoy a article on a site or if I have something to add to the discussion. Usually it’s caused by the passion displayed in the article I read. And after this article Bad TOR exit nodes attempts to login with sniffed password with your hacked account . I was moved enough to write a commenta response 😛 I do have some questions for you if you tend not to mind. Could it be only me or does it seem like a few of the comments appear like they are left by brain dead folks? 😛 And, if you are posting on additional places, I’d like to keep up with anything fresh you have to post. Would you list all of your public sites like your linkedin profile, Facebook page or twitter feed? rates of interest that could hurt you financially.